I have no issues with download from here. Can you download and install manually? 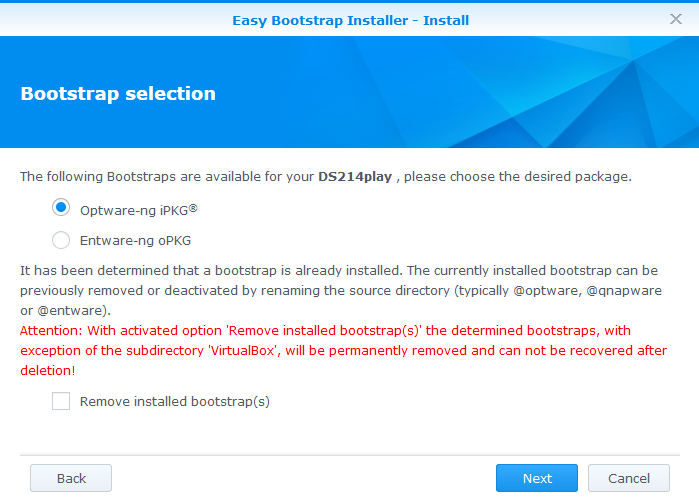 I removed previous version(22) with bootstrap and can't install this version. Why it does not install this version? current state is no response when click install button on DSM. Same for me. Installation fails with "Failed to install" message. I'm on a DS413. It is a ppc architecture. Sorry, not valid any more. I've tried to install "northstarplus" by mistake. I've just tried to install Easy Bootstrap Installer on my Synolody DS216play but I've got an error "This package is not supported on the platform of DiskStation". But since version 0.2-015 beta should be. Any ideas? Could we add Optware-ng Bootstrap or replace Optware bootstrap for Optware-ng? Looking at the error messages, all operations seem completed without any issues. The installation worked flawlessly on my other machines, DS213+ amd DS713+. Thanks, by the way, for the awesome package! In this form, unfortunately not possible, because the wizard and the required functions exist only starting from DSM 5.x. Maybe later I think of a stripped down version. Have you already tried the older Bootstrap Installer of http://packages.quadrat4.de? Is there a chance for .. In the german Synology support forum we also support the english speaking users, feel free to ask us. Any chance of English language support ? The feedback & howto links point to a german forum ?